Girls fantastic team work, effort and goals and your makeup skills need to improve!!! The open tournament saw the 4 teams play each other. The best two team Lakeland Youth and I’m proud of all of them. WELL DONE LAKELAND YOUTH The open tournament saw the 4 teams play each other. The best two team Lakeland Youth and Lakeland old boys met in the final. Played in a force 5 wind with 15 cm waves across the pitch. Lakeland old boys met in the final. Played in a force 5 wind with 15 cm waves across the pitch. A grey, drizzly morning saw three club members (Robin E, Mike P, John H) convene outside Kendal Leisure to load kayaks and equipment into one vehicle. Two hours later and we were on the Scottish side of the Solway near Dalbeattie, where it was still grey and drizzly. The target launch site was at Rascarrel Bay though online blogs from local dog walkers lead us to believe that we might have access difficulties due to new ownership. Sure enough we were quickly spotted by a security camera and told to leave – so much for liberal Scottish access laws. We retreated further east along the coast to Auchencairn and easily launched at Balcarry Bay across a foreshore of mussel shells embedded in mud. By this time the grey mist was breaking and the weather kept improving. We set off round the prominent rocky headland and headed SW under high sandstone cliffs with numerous auks and kittiwakes wheeling around. 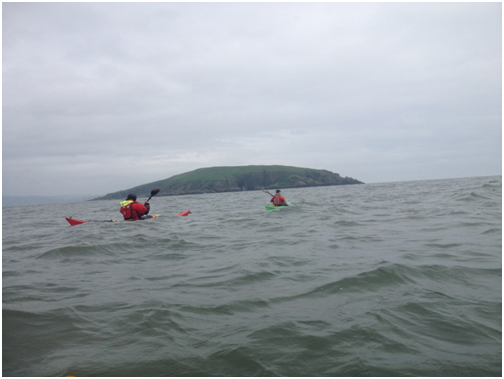 At this point we were paddling against an increasingly strong flood tide and with a noticeable southerly wind. Clapotis and a sizeable side-on swell made bird-watching a risky activity – and eventually a couple of large rollers surprised one member of the party resulting in Robin demonstrating how to carry out a quick and efficient rescue. Having made it round to view our proposed launch site at Rascarrel we about-turned and raced back along this spectacular stretch of cliffs with the current. Continuing past the headland we aimed for Heston Island in the mouth of Auchencairn Bay where we eventually landed on a gorgeous sandy beach on the north side. At very low Spring tides it is possible to walk across to the island but whilst we were there it felt truly isolated with white-topped waves between island and mainland. We ate lunch to the raucous background sound of the large herring gull colony. Next target was the coastal villages of Rockcliffe and Kippford, surfing up this arm of the estuary with both the tide and an increasingly strong back-wind. 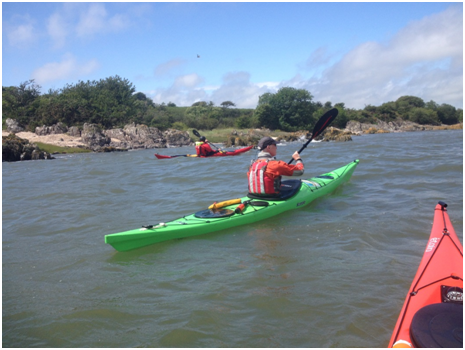 We quickly passed Rough Island, where nesting plovers and oystercatchers mean no access during the breeding season, and reached the jetty at Kippford as the lifeboat rib was being launched for a reported `upturned boat`. Diligent searching on Google Streetmap meant that Robin knew precisely where the ice-cream shop was! 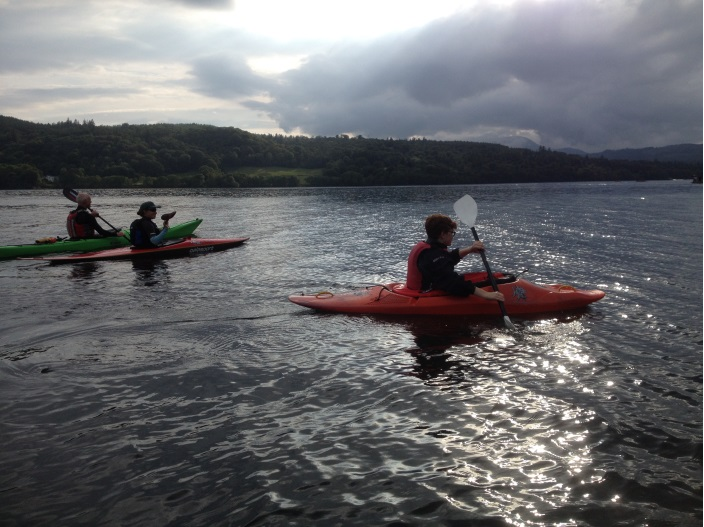 Delicious Cream of Galloway ice-creams were ordered – those who realised that the return paddle was going to require great effort adding a `99` flake to theirs. Following a quick visit to the local chandlers to find sealant for a leaky spraydeck (none in stock due to imminent closing down) we were back on the water and hugging the shore in order to find shelter from what was now a strong and steady southerly. Here the rocky coastal oakwoods growing down to high-water were reminiscent of the Cornish Fal estuary. 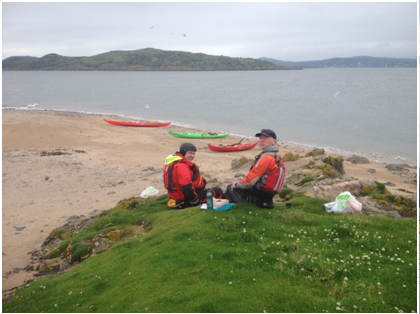 The final leg of the journey was across Auchencairn Bay where the powerful cross-wind meant that keeping a line was tricky – GPS tracking later showed how we’d been pushed up the estuary. Back in the relative shelter of Balcarry Bay there was the opportunity to practice valuable rolling and bracing skills. All in all a really enjoyable outing on a surprisingly varied and attractive stretch of coast – plus there’s lots more left to explore. 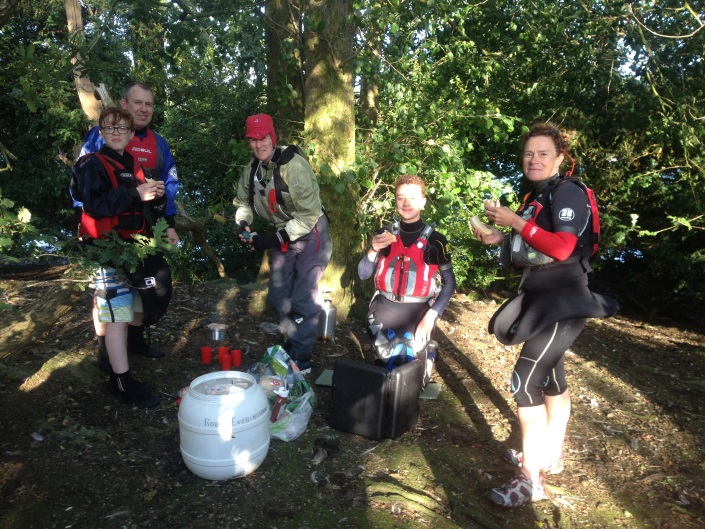 The sessions down at Miller Ground on Wednesday nights certainly drew in the variety of craft. 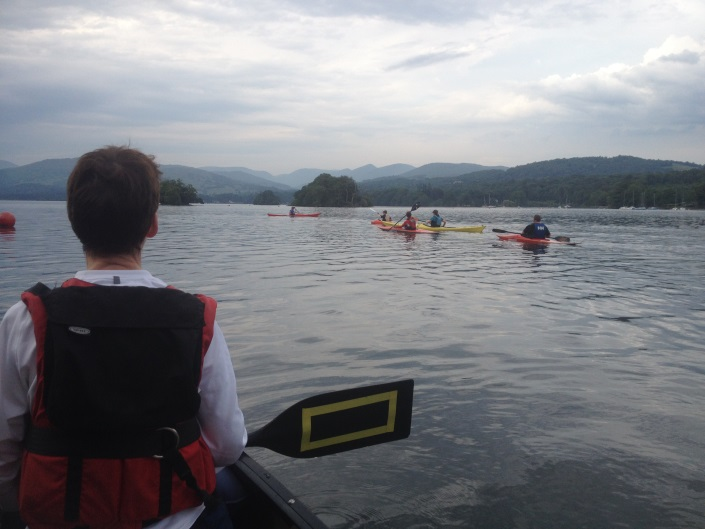 Most nights saw slalom boats, short river boats, open canoes, sea kayaks all mixed up in one group journeying in different directions. Weather was typically mixed, with photos from the better nights. There was even a surfing night, catching the waves whilst returning from Thomson’s Holme, not to mention the rarity of a mill-pond night! Barbecue on the last session on one of the islands: Testing the first hot dog skilfully prepared by chief cooks.